It’s been almost a year since we moved in our new home but we are still far away from being done with the interior decoration. It is fascinating how the amount of energy, ideas and time it takes to plan a house during construction is equal to what it takes to decorate the house tastefully. 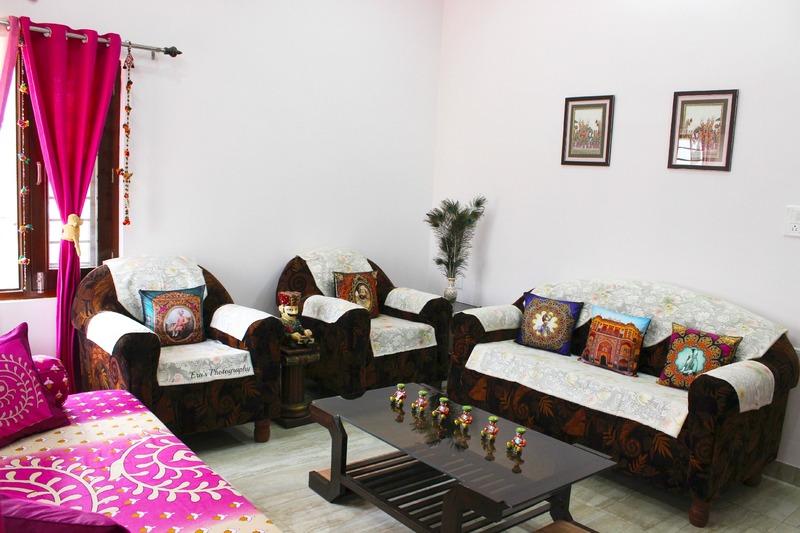 While we have been gradually working on the ‘Rajasthani theme’ to decorate our home, the one area we are yet not happy with, is our drawing room. It’s not the dearth of handicrafts or color schemes but lack of consensus on the final look that has tempted us to try many arrangements over time. 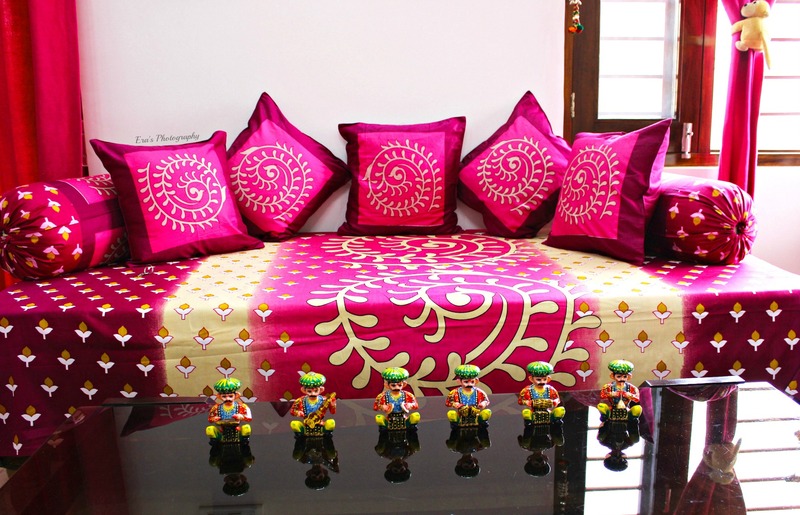 With our family roots in Rajasthan, being inclined to its royal, colorful culture comes naturally to us. But when working on interior decoration of an area as prime as the drawing room, creating a subtle blend of culture with strokes from the modern palette can be quite challenging. Of all the places in the world, the pink city, Jaipur is our favorite. With fond family memories spanning over generations, it’s passionate, playful, pink color has found place on our walls, linen and more. This has been our starting point in working on decorating our drawing room. There is no dearth of colors in Rajasthani handicrafts, but evolving a creative confluence of the same can be pretty tedious. The prime reason being, going overboard while shopping for handicrafts, creating a clutter than an artistic outcome, is pretty easy. With a wedding in the family in the coming months and my parent’s milestone anniversary round the corner, I took up the task of tastefully decorating our drawing room. In the past, we’ve requested our friends and family visiting Jaipur to bring along handicrafts based on our requirements. However, in matters of art and craft, one has to pick each product themselves to be fully satisfied. Despite, our love for Jaipur, visiting it often only for shopping isn’t a feasible option. But, luckily I struck gold. Check out the pictures before I spill the beans. Please click on the pictures to enlarge. 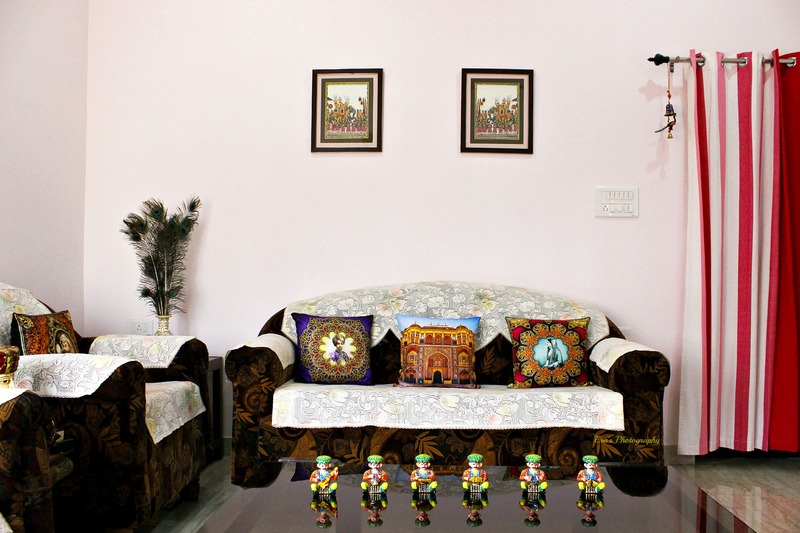 Meet the colorful musician figurines and seated on the sofa are ( from L to R on cushions) H.H. Maharaja Sardar Singh ji of Jodhpur, the regal architecture of Rajasthan and Maharani Sita Devi. While the varied styles, designs, patterns and color combinations have brought alive the rich cultural and traditional heritage, the intricately crafted figurines have added to the personality of our drawing room. From my three year old to the elderly, no one misses out on being enticed by their charm. 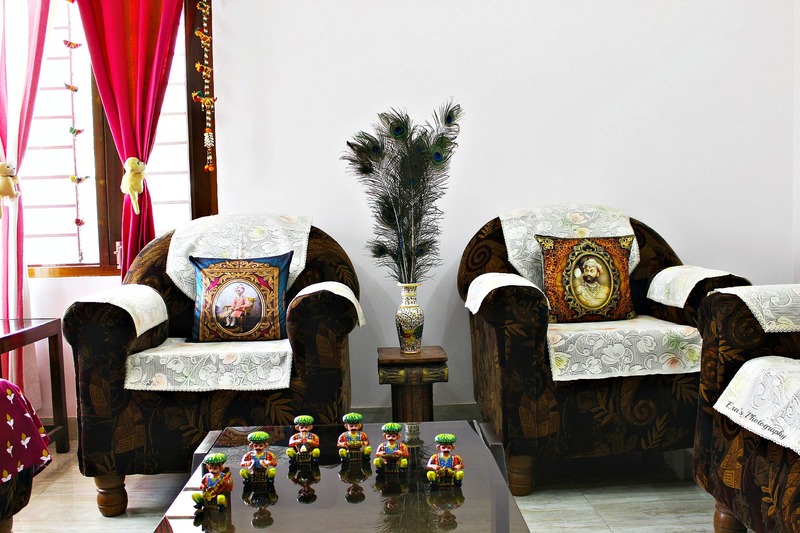 Maharaja Sir Bhupinder Singh (Left cushion), the beautiful hand-painted marble vase and Maharaja Sawai Sir Tukoji Rao II Holkar (Right cushion). The digital print cushion covers have been an instant hit. From their plush fabric to royal elegance, their presence has brought home a royalty with a hint of modern craftsmanship. They’ve amplified the rich feel of our small drawing room. But there’s more to it. Recently, my elderly aunt (my father’s eldest sister) visited us. She was amazed by these cushion covers because she could recognize each of the Maharajas and the Maharani. She had many anecdotes to share about their lives, Rajasthan’s glorious history, chivalry and beauty that have added another dimension to our love for these handicrafts. The tie and dye, block prints and batik have adorned our abode for generations. This time around we chose to be different. These assorted handicrafts have packed in the look of ‘Diwan-e-khaas’ to our drawing room in a budget that’s left me determined to shop more. The cuddly monkey curtain holders are Pari’s favorite, the strings of birds are symbolic of Rajasthani handicrafts and the Bani Thani of Kishangarh etched in Marble add charm to the corner of our drawing room. The elegant Marble vase never fails to bring a smile to everyone who sees it. It is an exquisite marvel of painting on marble with splash of colors and intricately crafted peacock. Marble of Rajasthan is world famous. The marble of the Taj Mahal too came from Makrana in Rajasthan. I have shopped for decor items and handicrafts online many times before. But on a couple of occasions, though purchase was easy, the products didn’t match the pictures shown and the quality wasn’t satisfactory. Besides, returns were such a hassle that I had come to dread shopping for home decor online. However, Flipkart is different. I have been a regular Flipkart customer since 2010. From kitchen appliances to mobiles to tablets to bed sheets, the list of the items we’ve shopped from Flipkart is endless. This was why trusting the ‘Home Store‘ came easy to us. Scrolling through Flipkart’s well-classified catalogue to find products is a breeze, more so on the mobile app. 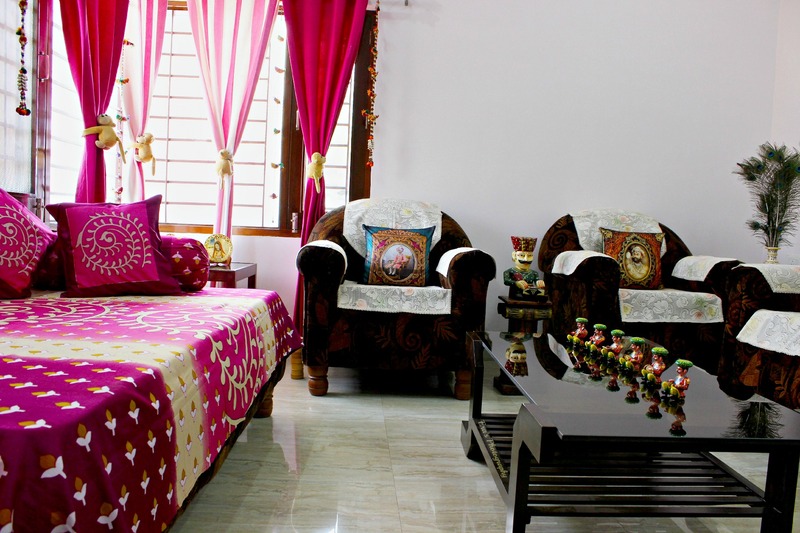 The biggest plus are the handicrafts arranged regionally, as per color scheme and the area of your home with helpful suggestions on every page. It took me less than five minutes to reach a vast, vibrant, colorful collection of Rajasthani handicrafts that I knew my home would love. Not only the aesthetics and the mind-blowing discounts but the litmus test of online shopping, return of the products has been tried in this venture. The Diwan-set I had initially ordered with hues of dark orange, was not liked by my aunt, she suggested going for something bright. We quickly browsed through Flipkart’s exhaustive collection and requested a return of the product. The commendable bit was, the return was organized in matter of minutes. I was constantly updated about when I should expect a pick-up and the refund was received within hours of the product’s return. This, I believe is a huge plus because there are occasions when we change our mind or need to seek a replacement because of any reason. I am impressed with the express delivery, careful packaging (especially of the figurines and the marble vase) and the quality of all the products. My wish-list is on a surging rise since my first purchase. With a family wedding round the corner, we already have a long list of gift items to be shopped from the home store. If you are thinking that the downpour of compliments that came my family’s way with the new setting of our drawing room were the only reason of my jubilation, let me add a cherry to this cake. On shopping from the ‘Home Store’ I also bagged Make My Trip discount vouchers that will give me a massive discount in my next travel (flights as well as the hotel stay). With Pari’s summer vacations round the corner, my family is already busy making plans for a royal getaway while I am loving welcoming the ‘Rangeelo Rajasthan’ in our home. I highly recommend you to go and check out the Flipkart Home Store. I am sure; you’ll find classy products to compliment your lifestyle or a perfect gift for someone you love, in no time. * Padharo Mhare Desh in Rajasthani/ Marwari means ‘Welcome to our land’. Oh-My-God! Being from a Marwaari and Rajasthani Background. I have this soft corner for Rajasthani stuff . This is indeed Beautiful. I was like Oh-WOW! Very nicely done… And yes i love those Maharaja/maharani cusions & marble piece too. Good job. This is gorgeous! So bright and happy. Oh my my! How beautifully set up! Loved it! I’m bookmarking so that when I think of re-decorating my home again, I will take tips from this 🙂 Beautiful! Hi Era, its beautiful!! I can only imagine how peaceful you feel,when you are in your space! Love it! it looks too good. to tell the truth, i am architect, but i never put in so much care for my own house. now after reading your post i am tempted to shop and redecorate my house. but i am just waiting to buy my house and do the stuff. i just loved the corner window. its a beauty by itself. Good to read. I’ve written about Flipkart many a times in the past…their service is great, too!